With the eruption of the Korean pop industry, the Korean skincare and beauty industry has also enjoyed an explosive success. Sheet masks, most notably, have become a staple in the skincare routine lineup. Chinese actress Fan Bingbing (范冰冰) admitted to using more than 600 sheet masks a year and is famously known to go out in public with a sheet mask on. The popularity of sheet masks have extended to the Western culture as well. Even Hollywood celebrities, such as Chrissy Teigen, Maisie Williams, and Drew Barrymore, for example, have posted selfies of themselves in sheet masks. Hong Kong star, Gillian Chung (鍾欣潼), has always been noted for her great skin texture and youthful looks. 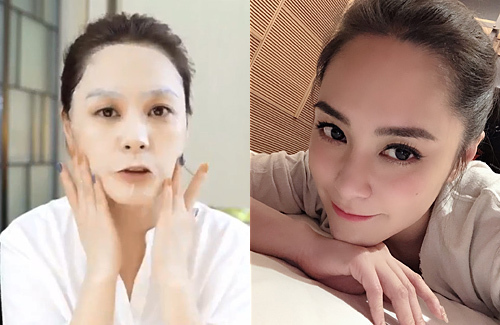 Recently, the 38-year-old went online to share her sheet mask and skincare tips. The “1-Day-1-Mask” challenge is a popular practice among sheet mask users. However, Gillian advises against this routine. Although frequent use of sheet masks helps moisturize the skin, excessive moisture is not always a good thing. When the moisture level on your skin is too high, it will clog your skin and prevent it from being able to breathe properly. Furthermore, the outer layer of the skin will also lose its elasticity. If this continues for a prolonged period of time, your skin will be unable to cope with dry environments. When your innate adaptability is damaged, it will be harder for your skin to repair itself when needed. As such, Gillian advised that using three sheet masks a week will suffice. Many have perhaps heard about the advice of sheet masking right before applying makeup, so that the base products will be applied on more smoothly. Gillian, however, advised against this. As stated in Tip #1, the water content of the outer layer of your skin will increase instantaneously after using a sheet mask. The refractive index of the light will also increase, making the skin appear bright and hydrated. However, makeup contains a lot of harmful chemicals, and the stimulating ingredients in the makeup will seep into the skin with its increased moisture, which will cause damage to the skin in the long run. Instead, Gillian advised to sheet mask the night before a big event. Another popular myth, according to Gillian, is the concept of not washing your face after sheet masking. While the sheet mask is on your face, your skin will have absorbed all the serum it can possibly take in. The remaining residue on your face will not be absorbed into the skin anymore. Leaving it on your face will only put you at risk for acne and blackheads. Gillian advised to splash and lightly clean your face with warm water after removing the sheet mask, then proceed to applying serum and night cream before going to bed. Although Gillian’s taut and smooth skin is a testimony to her skincare methods, everyone’s skin is different. Factors such as diet, environment, habits, and routines all contribute to the condition of your skin. As such, what works for one person may not work for another. Has this site become a weight loss and skincare site?